Add-A-Shelf® Adjustable Shelves, Posts and Wire Shelves. Add-A-Shelf® adjustable shelves. Patent #5,884,567. For all security units. Allows addition or removal of shelf without disassembling unit. 300 lb. weight capacity per shelf. Optional wire shelves are for full-size security units. Shelves must be installed when assembling unit. 1430C 14" x 30" chrome wire shelf. 1430E 14" x 30" EAGLEgard® hybrid epoxy with MICROGARD®, wire shelf. 1430S 14" x 30" stainless steel wire shelf. 1436C 14" x 36" chrome wire shelf. 1436E 14" x 36" EAGLEgard® hybrid epoxy with MICROGARD®, wire shelf. 1436S 14" x 36" stainless steel wire shelf. 1448C 14" x 48" chrome wire shelf. 1448E 14" x 48" EAGLEgard® hybrid epoxy with MICROGARD®, wire shelf. 1448S 14" x 48" stainless steel wire shelf. 1460C 14" x 60" chrome wire shelf. 1460E 14" x 60" EAGLEgard® hybrid epoxy with MICROGARD®, wire shelf. 1460S 14" x 60" stainless steel wire shelf. 2430C 24" x 30" chrome wire shelf. 2430E 24" x 30" EAGLEgard® hybrid epoxy with MICROGARD®, wire shelf. 2430S 24" x 30" stainless steel wire shelf. 2436C 24" x 36" chrome wire shelf. 2436E 24" x 36" EAGLEgard® hybrid epoxy with MICROGARD®, wire shelf. 2436S 24" x 36" stainless steel wire shelf. 2448C 24" x 48" chrome wire shelf. 2448E 24" x 48" EAGLEgard® hybrid epoxy with MICROGARD®, wire shelf. 2448S 24" x 48" stainless steel wire shelf. 2460C 24" x 60" chrome wire shelf. 2460E 24" x 60" EAGLEgard® hybrid epoxy with MICROGARD®, wire shelf. 2460S 24" x 60" stainless steel wire shelf. 3030C 30" x 30" chrome wire shelf. 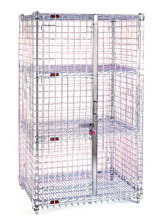 3030E 30" x 30" EAGLEgard® hybrid epoxy with MICROGARD®, wire shelf. 3030S 30" x 30" stainless steel wire shelf. 3036C 30" x 36" chrome wire shelf. 3036E 30" x 36" EAGLEgard® hybrid epoxy with MICROGARD®, wire shelf. 3036S 30" x 36" stainless steel wire shelf. 3048C 30" x 48" chrome wire shelf. 3048E 30" x 48" EAGLEgard® hybrid epoxy with MICROGARD®, wire shelf. 3048S 30" x 48" stainless steel wire shelf. 3060C 30" x 60" chrome wire shelf. 3060E 30" x 60" EAGLEgard® hybrid epoxy with MICROGARD®, wire shelf. 3060S 30" x 60" stainless steel wire shelf. A1436C 14" x 36" chrome, Add-A-Shelf® adjustable wire shelf. A1448C 14" x 48" chrome, Add-A-Shelf® adjustable wire shelf. A2436C 24" x 36" chrome, Add-A-Shelf® adjustable wire shelf. A2448C 24" x 48" chrome, Add-A-Shelf® adjustable wire shelf. A2460C 24" x 60" chrome, Add-A-Shelf® adjustable wire shelf. QA1436C 14" x 36" chrome, Quad-Adjust® wire shelf. QA1436E 14" x 36" EAGLEgard®, Quad-Adjust® wire shelf. QA1436S 14" x 36" stainless steel, Quad-Adjust® wire shelf. QA1448C 14" x 48" chrome, Quad-Adjust® wire shelf. QA1448E 14" x 48" EAGLEgard®, Quad-Adjust® wire shelf. QA1448S 14" x 48" stainless steel, Quad-Adjust® wire shelf. QA1460C 14" x 60" chrome, Quad-Adjust® wire shelf. QA1460E 14" x 60" EAGLEgard®, Quad-Adjust® wire shelf. QA1460S 14" x 60" stainless steel, Quad-Adjust® wire shelf. QA2436C 24" x 36" chrome, Quad-Adjust® wire shelf. QA2436E 24" x 36" EAGLEgard®, Quad-Adjust® wire shelf. QA2436S 24" x 36" stainless steel, Quad-Adjust® wire shelf. QA2448C 24" x 48" chrome, Quad-Adjust® wire shelf. QA2448E 24" x 48" EAGLEgard®, Quad-Adjust® wire shelf. QA2448S 24" x 48" stainless steel, Quad-Adjust® wire shelf. QA2460C 24" x 60" chrome, Quad-Adjust® wire shelf. QA2460E 24" x 60" EAGLEgard®, Quad-Adjust® wire shelf. QA2460S 24" x 60" stainless steel, Quad-Adjust® wire shelf. SP74-CS 74" optional chrome post for full-size security units. SP74-ES 74" optional EAGLEgard® post for full-size security units. SP74-SS 74" optional stainless steel post for full-size security units. SP86-CS 86" optional chrome post for full-size security units. SP86-ES 86" optional EAGLEgard® post for full-size security units. SP86-SS 86" optional stainless steel post for full-size security units.